On the grounds of the New Capitol Building, just north of the east wing, is an unusual pediment on a small island surrounded by the parking area. If you have ever stopped and read the plaque that stands in front, then you know that it is the figurehead for the proud battleship USS Mississippi, commissioned in February of 1908. This ship, however, was only one of four warships of the United States Navy bearing that name. The first ship to be named the USS Mississippi was a steam-powered, side-wheel frigate (right) built at the Philadelphia, Pennsylvania Navy Yard under the supervision of Commodore Matthew Perry (shown at left in a Japanese print) and named for the Mississippi River. 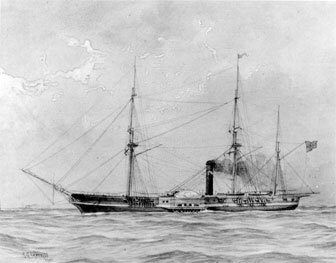 Commissioned in December of 1841, she was instrumental in experiments crucial to the development of the steam Navy before becoming Commodore Perry’s flagship in 1845. After two tours in the Gulf of Mexico during the Mexican War, she cruised the Mediterranean for three years before serving as Commodore Perry’s flagship during his voyage to open up Japan to Western trade in 1853. During the Civil War, the Mississippi ran aground while attempting to pass the forts guarding Port Hudson, Louisiana, on the Mississippi River north of Baton Rouge. Since recovery was impossible, and capture by Confederate forces inevitable, the ship was purposefully destroyed by her crew. We jump ahead to the third ship named Mississippi, a New Mexico-class battleship (right). Commissioned in 1917, she saw heavy action in the Pacific during World War II and was one of the ships present in Tokyo Bay at the signing of the Japanese surrender. In 1946, after the war, she was converted to a training and gunnery ship before being decommissioned and sold for scrap. 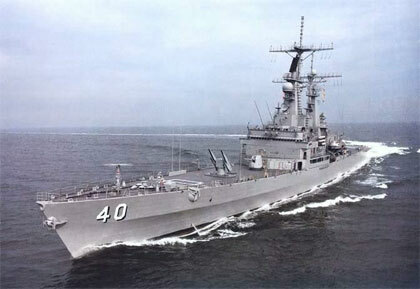 The fourth U.S. Navy warship to carry the name Mississippi was a Virginia-class nuclear-powered missile cruiser, the USS Mississippi CGN-40, at the time, the world’s most advanced (left). Commissioned in 1978, she served in the Mediterranean during the Gulf of Sidra confrontation with Libya, and later, she deployed with the USS John Kennedy Battle Group to support Operation Desert Shield in 1990. 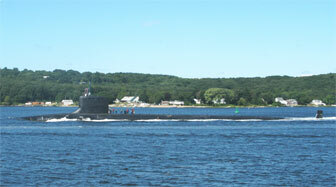 After 18 years service and five Battle Efficiency Awards, the USS Mississippi was decommissioned in 1996. Her ship's bell can be seen in the gardens at Rosalie Mansion, on the site of Fort Rosalie overlooking the Mississippi River. 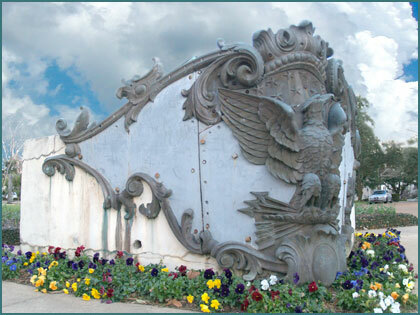 And what of the ship that once carried the figurehead that is now on the Capitol grounds? The second USS Mississippi was one of two 13,000-ton Mississippi-class battleships built by William Cramp & Sons of Philadelphia, Pennsylvania and commissioned in 1908 (right). The Mississippi operated for the most part in the Gulf of Mexico, the Caribbean, and along the eastern coast of United States, taking one cruise up the Mississippi River as far as Natchez in order to impress taxpayers with contemporary naval technology, and one cruise across the Atlantic in 1910 to ports in France and Great Britain. 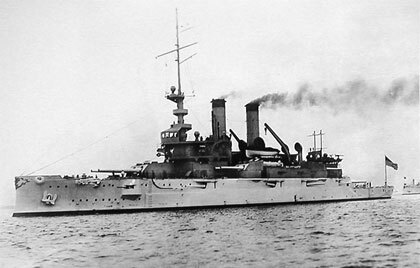 During the Mexican Civil War (1911–1914), the Mississippi was the first Navy ship to deploy military aircraft, launching nine reconnaissance flights over the Vera Cruz area during a period of 18 days. Decommissioned and sold to the Royal Hellenic Navy of Greece in July of 1914, the USS Mississippi was renamed the Kilkis. She served the Greek Navy for 23 years before being sunk in World War II in an air attack by German dive bombers on Salamis Harbor in April 1941. Her hull was salvaged for scrap after the war ended. 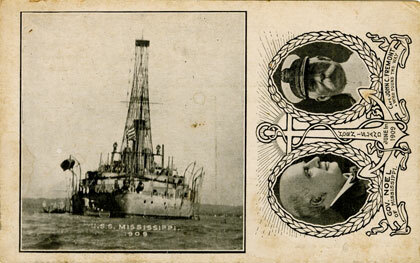 The figurehead, however, had been presented to the State of Mississippi by the Navy Department prior to this in 1908. Above left are two views of the deck of the USS Mississippi, showing (top) a Curtiss "AB" type flying boat on deck to the left, used during the 1914 Vera Crus operation and (bottom) a view of the ship's bridge and forward gun turret. The photo on the right shows the rechristened Kilkis lying awash in the Salamis Harbor during World War II. 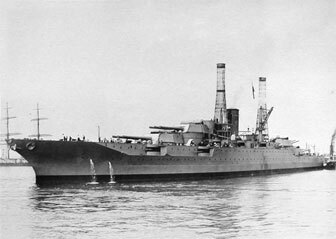 interestingly enough, the second Mississippi-class battleship was the USS Idaho. She, too, was sold to the Greek Navy, renamed the Limnos, and sunk alongside the Kilkis. Her observation masts can be seen behind and to the left of the Kilkis. UPDATE: On January 30, 2008, the US Navy named the ninth Virginia-class nuclear submarine—under construction since 2006—the USS Mississippi. She is expected to be completed in 2013. According to a U.S. Department of Defense News Release, "The selection of [the name] Mississippi, designated SSN 782, is dedicated to the state’s long standing tradition of shipbuilding in support of our nation’s defense. It also honors the indomitable spirit of the people of Mississippi who have made great strides in recovering from the devastation of Hurricane Katrina." 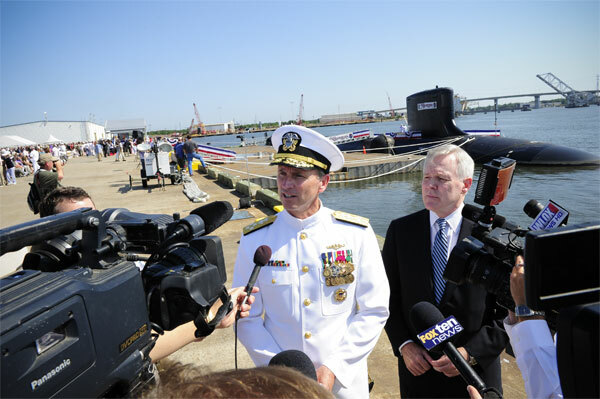 At left is a photograph of the USS Virgina, the first submarine of this class, commissioned on October 24, 2004.